In the 2015-16 school year, a partnership formed in Thunder Bay across sectors to work together and promote mental health and wellness. This team – involving the Thunder Bay Catholic District School Board, Children’s Centre Thunder Bay Foundation (CCTB) and the Thunder Bay District Health Unit (TBDHU) – chose to adapt the RNAO Championship project for the three Catholic senior elementary schools in Thunder Bay. After the training, the students returned to their individual schools to evaluate their school needs, then develop and implement their action plans accordingly. Each team of champions was supported by a school guidance counsellor as well as a member from the CCTB team and a public health nurse. The champions met over their lunch hour weekly during the month leading up to mental health week (May 9-13, 2016). School action plans, based on a physical and social environmental scan, were created in collaboration with all team members. 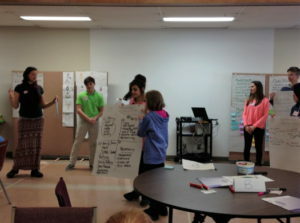 Each team planned something different and tailored to their school’s unique needs. Pope John Paul II Sr. Elementary School planned a full afternoon pep rally to focus on social connectedness and mental health literacy. The students noticed in their evaluation that the students in the school were very disconnected from one another and had little understanding of mental health. The students were excited and very engaged in planning and implementing this initiative. 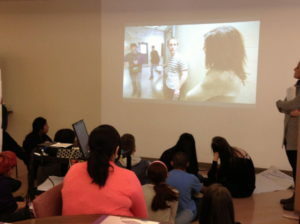 The students also created a video to show at the event called “You Are Beautiful” – with its positive message that all students are beautiful and that three simple words can make a huge positive change in someone’s day. Bishop E.Q Jennings School decided that they would target the social environment to improve the overall mental wellness of the school. The students planned to stand at each entrance where students and staff enter to hold the door open and greet everyone every day for a specified period. They would then evaluate the impact this specific, simple act of social kindness has on their own mental well-being at school and on the mental well-being of staff and students. Each team of student champions will evaluate and celebrate their hard work. At each school celebration event, a final evaluation will be done focusing on what was effective, what needs to be changed and what students have to say about the quality of their experience as student mental health champions. The Thunder Bay District Catholic School Board is planning to showcase the work of the student champions and will work with the schools and partners to sustain and build upon the learning from this initiative.